Hairdressing And Barbering – 5 weeks duration (2 days a week) job available after training. – Health and safety – Customer service – Customer care – Products – Tools. – Models (bring yourself required) – Students feel first shave. – Teach razor and sharpening – On same day 10% product – Design beard. Time 1hr 30min per session (2x) 3hr rest of the day observe other shaves and different texture of beard. We use badges, brushes, good quality products, hygiene, safety nice traditional shave. Cost of course – £350 Aj Design Certificate, £750 NVQ Certificate. Charities to whom it may concern. 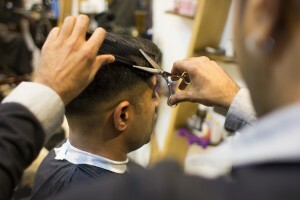 We are a Professional Hairdresser/ Barber , established business & over 18 years experience. I work with Charities & other Government Bodies for many years, what I’m offering is my time & skill to people who work for any Charity. I will be cutting their hair for 50% off and in return all the money we raise will go to chosen Charities , that’s my idea to volunteer or Free Haircuts for Disabled & Elderly Peoples Homes, if it is ok, we can go ahead and work on a time to schedule for this day and where. Would appreciate if you have other ideas where we can implement to Help out there or each other. Thanking you for your support, looking forward to hear from you.